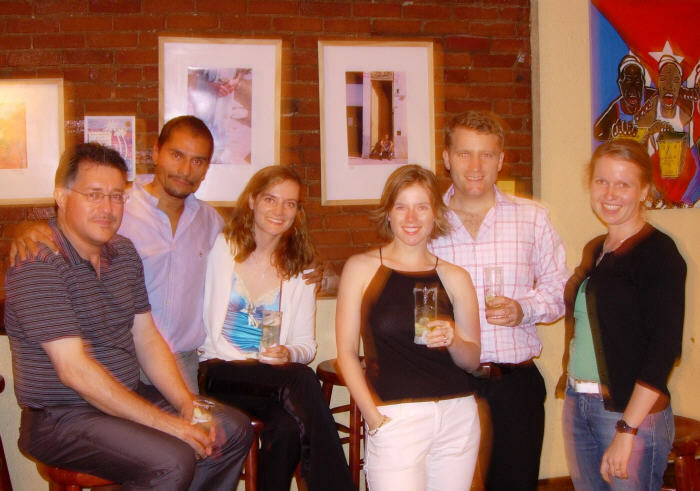 The AFLSE Washington, D.C. chapter compiles a bimonthly Community Bulletin, which can contain information on job openings, queries from those alumni looking for a job; apartment/house-share listings; need for participants in sports; advertisement of academic lectures; and other news relevant to the D.C. AFLSE community. The International Policy & Economics Lecture Series (IPE) features numerous prominent LSE alumni in the Washington, DC area. Come in out of the cold and enjoy a cup of tea and conversation with fellow alumni! AFLSE members, friends, recent grads, and future students are all welcome! We will be in a back room - look for the LSE signs. The Washington, DC chapter holiday party was held in the Metropolitan Lounge of Bistro Napoleon, owned by our fellow alum Omar Popal. All bachelor's, master's, Ph.D., and general course students and their parents were welcome, and of course LSE alumni and friends were encouraged to attend. Zhou Wenzhong is the Ambassador of the People's Republic of China to the United States, and an LSE alumnus (1975). Special thanks to Joy Dunkerley for hosting this year's Bon Voyage Afternoon for new LSE students. Was held at the French Embassy. Emerging Markets: Mania or Mainstream? Click here to view photo from the event. “Lincoln’s Other White House: The Untold Story of the Man and His Presidency”. AFLSE DC Chapter would like to thank Havana Village management and staff, as well as Leon for contributing their time and resources to the effort of helping raise money for the Whitman Walker Clinic. Also, thanks to those LSE Alumni who came out to dance! Click here to view photo from event. “Noche de Baile” Fundraiser for Mary’s Center at Havana Village. Click here to view photos from the party. SUCCESSFUL ALUMNI WEEKEND IN WASHINGTON, D.C.! British Embassy Reception: The Ambassador, Sir David Manning, hosted a reception at the British Embassy for the AFLSE this past Friday. Sir Howard Davies, the Director of the LSE, spoke at the reception, noting positive academic and program changes at the LSE. D.C. Chapter Annual Dinner: The D.C. Chapter of the AFLSE hosted a rooftop reception overlooking the White House and Washington Monument and dinner on Saturday night, at the historic Hotel Washington. The dinner’s featured speaker was Stanley Fischer, President of Citigroup International, and former Deputy Managing Director of the International Monetary Fund. He was introduced by Clara Montanez, lead co-chair of the D.C. Chapter, and Vice President of UBS Financial Services. Dr. Fischer expounded upon his views on globalization and the importance of LSE education in his own life and research. He was accompanied by Rhoda, his wife of 40 years. 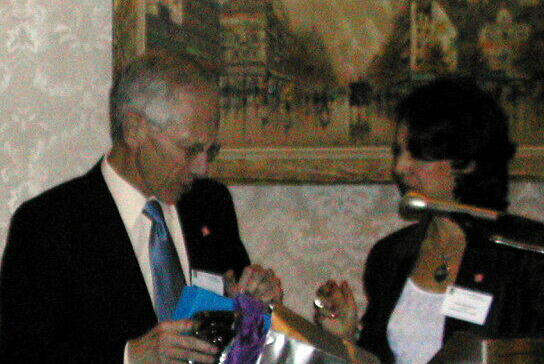 Clara Montanez, DC Chapter Leader, makes presentation to Stanley Fischer, speaker and guest of honor. 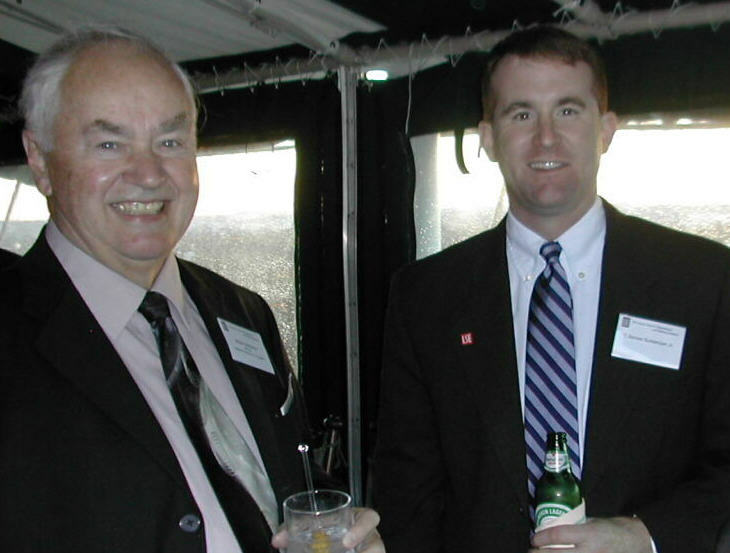 Walt McMahon and Ben Burkemper, two chapter leaders from the Mid-West, who had flown in for the weekend events, enjoy a pre-dinner drink.